La Fondazione LINKS, tra le azioni volte a formare personale qualificato nei diversi ambiti mette a disposizione un certo numero di proposte di tesi di laurea da svolgere presso i laboratori della Fondazione, sotto l’attenta supervisione dei ricercatori LINKS. Se sei uno studente universitario giunto al termine del tuo percorso di studi e sei interessato a scoprire cosa può offrire la Fondazione per aiutarti ad intraprendere una carriera professionale nel mondo della ricerca, controlla qui sotto l’elenco delle proposte di tesi attualmente disponibili e manda la tua candidatura all’indirizzo e-mail che trovi specificato all’interno dell’annuncio. Sarai contattato dal nostro personale amministrativo per concordare un colloquio conoscitivo. …allora cosa aspetti? Scegli la tesi che preferisci e contattaci! 4D-GRAPH-X project aims at assessing the diagnostic potential of phase-contrast Xray imaging in reconstructing deformable objects. Introducing a new approach for 3D acquisition of moving samples represents an important step for improving the sensitivity of phase contrast CT while opening the path to a clinically compatible layout for phase contrast lung imaging. 4D GRAPH-X will focus on capturing and reconstructing with high-resolution and high-contrast the location and movement of an anthropomorphic thorax phantom’s structures over time. reconstruct and analyze the motion compensated images. After implementation, the algorithm will be validated with measurements in a CT laboratory setting. The internship will take place at the Department of Physics and INFN Torino (Via Giuria 1, Torino). The thesis will be developed at the Department of Physics and INFN Torino (Via Giuria 1, Torino), under the supervision of Dr. Alessandra Patera. Contact: send a resume with attached the list of exams to giorgio.giordanengo@linksfoundation.com specifying the thesis code and title. Antenna and EM Field measurements on large structures such as radio towers, radar systems and radiotelescopes is a very challenging task. These measurements are necessary to both verify the system performance and to avoid any health risk for the surrounding people. Nowadays, the emerging technology of Unmanned Aerial Vehicles (UAVs or drones) is being exploited to perform these measurements at a lower cost and with higher flexibility with respect to either baloons or helicopters. This ongoing research activity features many aspects ranging from the electromagnetic design of the UAV and the onboard antennas, the measurement strategies, the onboard and on ground RF equipment and the post-processing techniques. The latter are particularly challenging in near-field conditions, owing to the irregular paths that are typical of a UAV-based scan. Specific near-field to far-field transformations should be developed. The thesis will be developed at Consiglio Nazionale delle Ricerche, under the supervision of Dr. Oscar A. Peverini and Dr. Giuseppe Virone. Virone, et al., “Antenna pattern verification system based on a micro unmanned aerial vehicle (UAV),” IEEE Antennas and Wireless Propagation Letters, vol.13, pp. 169-172, Jan. 2014. Pupillo, et al., “Medicina array demonstrator: calibration and radiation pattern characterization using a UAV-mounted radio-frequency source,” Experimental Astronomy, vol. 39, pp. 405-421, Apr. 2015. Additive Manufacturing (AM), most widely known as 3D printing, has the potential to change how future RF products are designed, integrated and operated. This technology is already considered as strategic for space telecommunication applications, both for ground and space segments. Indeed, AM will enable design for performance, mass customization, design flexibility, miniaturization of complex RF systems operating at high frequencies (beyond 20 GHz). To attain these goals, while fulfilling the required high RF performance, AM-oriented layouts of antennas and feed-system components have to be designed through a concurrent engineering approach [1, 2]. The present activity will focus on the development of an antenna for Direct-To-Home TV services that can be easily customized to the users’ geographical location through the application of additive manufacturing technologies. A. Peverini, et al., “Selective Laser Melting Manufacturing of Microwave Waveguide Devices”, Proceedings of the IEEE, vol. 105, no. 4, pp. 620-631, April 2017. A. Peverini, et al., “Additive manufacturing of Ku/K-band waveguide filters: a comparative analysis among selective-laser melting and stereo-lithography”, IET Microwaves, Antennas & Propagation, August 2017. 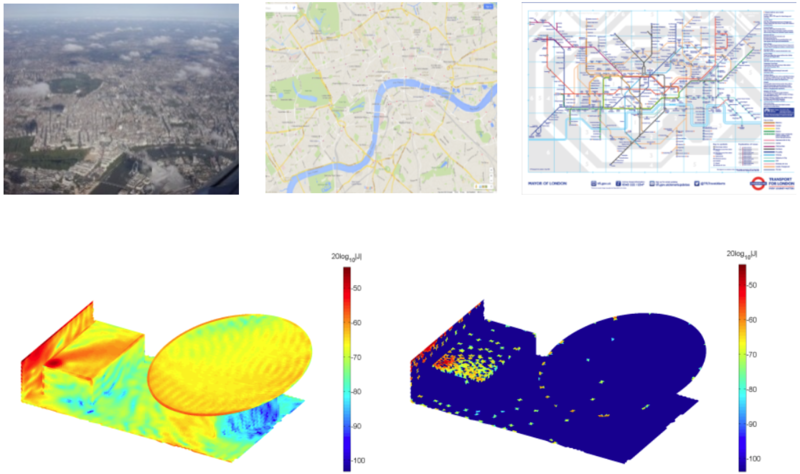 Numerical simulations are routinely employed to model complex systems, as electromagnetic waves propagation. In a similar way, maps are used to describe physical locations1. However, if one want to study different responses varying the parameters of the systems, the computational burden becomes too large, and often just a reduced part of the system output is of interest. In the maps analogy, one is interested just in the public transportation network to plan different routes. From a computational point of view, simpler and compact models can be constructed from representative solutions of the complete system, using different technique to combine them together1,2. This thesis aims at porting existing code for electromagnetic simulation on a distributed architecture, with the specific aim of using it for building reduced order models for Computational Electromagnetics. The exhaustive RF end-to-end testing of an antenna can be complex and time consuming. Due to the sampling criteria limit, the measurement time associated with these complex tests becomes easily prohibitive. Advanced strategies for end-to-end test time reduction are very appealing and recently (1,2), an algorithm based on a properly hybridization of measurements and simulations has been proposed, to demonstrate the possibility to perform a radical under sampling measured field of the Antenna Under Test (AUT), with respect to the conventional Nyquist criteria. The thesis would like to improve the performance of the algorithm by investigating the possibility to extend the method to other domains (e.g. frequency, space, etc.). J. Foged, L. Scialacqua, M. Bandinelli, M. Bercigli, F. Vipiana, G. Giordanengo, M. Sabbadini, and G. Vecchi, “Numerical Model Augmentend RF Test Techniques,” in 6th European Conference on Antennas and Propagation, EuCAP, March 2012. J. Foged, L. Scialacqua, F. Saccardi, M. Bandinelli, M. Bercigli, G. Guida, F. Vipiana, G. Giordanengo, M. Sabbadini, and G. Vecchi, “Innovative Approach for Satellite Antenna Integration and Test/Verification,” in 34th Symposium of the Antenna Measurement Techniques Association (AMTA), October 2012. Solutions to Maxwell’s equations are known only for a few simple geometries; this is where the scientific discipline known as Computational Electromagnetics (CEM) comes into play, aiming at a numerical solution of the equation in presence of non-trivial geometries/materials. Accurate and time-efficient image processing tools are essential for autonomous driving vehicles. A timely detection of other vehicles, road users and obstacles can ensure to the autonomous vehicle the capability to perform safe road manoeuvres. Several cutting-edge tools are now being proposed by several research actors and companies. In the autonomous driving context, it is necessary to find the best trade-off between accuracy and time performance given the resources-constrained environment. A thorough evaluation is needed as well as a customization of the tools for the autonomous driving context. The aim of the thesis is to evaluate different image processing tools for finding the most suited for the automotive driving context. Customization of the selected tool is the final target of the thesis. The first part of the thesis will be devoted to the analysis of cutting-edge image processing tools for selecting the most suitable one for the specific targeted scenario. The evaluation will be based on different performance criteria. In the second part of the thesis, the student will customize the selected image processing tool for enhancing its performance for the context of autonomous driving. The student will have the possibility to work with real-data coming from the field in an informal cutting-edge research laboratory using the latest available technologies on these fields. The knowledge of the surrounding environment is crucial for the connected and autonomous vehicles. These vehicles must timely know the position and the trajectories of other road users to perform safe road manoeuvres. If other road users cannot communicate such information, each vehicle has to rely on its own sensors to identify other cars, bicycles and pedestrians and to foresee their trajectories. A significant support can be provided from the road-side infrastructure. In critical places, fixed sensors can continuously sense the surrounding environment to identify vehicles, pedestrians, other road users and obstacles and the infrastructure can communicate the gathered information to the connected vehicles. The aim of the thesis is to develop a framework for the identification of road users and for the prediction of their trajectories. The first part of the thesis will be devoted to the analysis of state-of-art objects tracking methods. In the second part of the thesis, the student will develop a real object tracking system exploiting available cutting-edge image processing tool. Final step is the definition of trajectory prediction algorithm exploiting the gathered information. Public procurement contracts are a rich source of knowledge necessary for seizing the efforts in participating to public procurement calls. However, contracts are usually available in textual format making harder the task of extracting structured information automatically and being used in automated systems. This thesis will focus on extracting structured information from those documents such as specific dates, unique identifiers (VAT id, protocol numbers, telephone number), named entities (places, people, business entities, products). In this thesis the undergraduate will study and experiment with deep learning and natural language processing techniques that are the core of the Artificial Intelligence stack, by understanding the intrinsic semantics of document and identifying and linking pivotal information found in the text to an external database. The thesis will be co-tutored with Synapta Srl, a Spin-off of Politecnico di Torino. It will be an opportunity to work also with the Synapta team experimenting with real data. The undergraduate will benefit from being immersed in a existing start-up environment while applying scientific experimental practises learned in ISMB. At the end of the thesis, the undergraduate will be familiar with deep learning and natural language processing techniques, and she/he will acquire an understanding of the public-procurement domain. As additional benefit, she/he will proficiently use control version systems, continuous integration systems, remote deploying and monitoring techniques. Contact: send a resume with attached the list of exams to giuseppe.rizzo@linksfoundation.com specifying the thesis code and title. Motivation: One of the hottest topics of the last century is the environment preservation. Particularly, over the last years, the attention of our society has been focused, in the industrial context, on the need of reducing both waste production and toxic emissions. Internet-Of-Things (IOT) has become a well-established reality over the past years: by introducing very advanced devices and exposing heterogeneous service it has been used in various scenarios and areas of interest, i.e. the industry domain. IOT devices have already been adopted in factories, contributing to a more sustainable production. Such an interest adoption of IOT solutions has attracted ISMB’s interest, leading to the investigation on how Multi Agent Systems can be used in conjunction with IOT technologies to pursue the objectives previously described. A multi-agent system is a computerized system composed of multiple interacting intelligent agents, thought for resolving problems that would result difficult or impossible to solve for an individual agent. MAS can be used in the most disparate domains, ranging from Distributed Constraints Optimization (DCO) problems to coordination and delegation of computational tasks. Objectives: This thesis will focus on the analysis and development of a Multi-Agent System (MAS) interacting with an IOT system, providing asynchronous data in a Fabric-Of-the-Future context (e.g. waste management collection and dispatching). After a state of the art survey of MAS, the student will build a system in either a collaborative or antagonist scenario, exploiting standard communication protocols (such as AMQP, MQTT, etc.). Furthermore, the student will analyze existing algorithms and interaction protocols (e.g. consensus algorithms, Vickrey auctions, etc.) in order to solve complex distributed problems such as searching the Pareto optimality in a virtual marketplace scenario. Contact: send a resume with attached the list of exams to claudio.pastrone@linksfoundation.com or giuseppe.pacelli@linksfoundation.com specifying the thesis code and title. Objectives: This thesis will focus on the analysis and development of a Multi-Agent System (MAS) interacting with an IOT system, providing asynchronous data in a Fabric-Of-the-Future context (e.g. waste management collection and dispatching). After a state of the art survey of MAS, the student will build a system in either a collaborative or antagonist scenario, exploiting standard communication protocols (such as AMQP, MQTT, etc. ). Furthermore, the student will analyze existing algorithms and interaction protocols (e.g. consensus algorithms, Vickrey auctions, etc.) in order to solve complex distributed problems such as searching the Pareto optimality in a virtual marketplace scenario. Motivation: The number of mass-market application and services leveraging position information is continuously growing. The increasing availability of GNSS-enabled devices eases the growth of location-based solutions (LBS) also beyond personal applications. Furthermore, the concrete global business of the Internet of Things (IoT) is influencing almost all application domains, thanks to the massive amounts data generated by autonomous, connected objects all over the world. Exponential growth in the number of deployed IoT devices is foreseen to exceed the value of 4000 billion€ before 2025 – with a growing share of devices offering position information. Because interconnected devices collect and share large amounts of sensitive information, including personal position information, it is crucial to safeguard the privacy and security of users and the data exchanged throughout private and public networks. Objectives: Study and implementation of state-of-the-art multi-service federation approaches to facilitate and foster interoperability of LBS with Internet of Things (IoT), Smart City, and Collective Awareness Platforms. Such integration aims to provide LBS outside the traditional bound of location-based applications and businesses. Special attention will be given to interoperability considering e-security aspects (ranging from secure certificate-based services to light-weight identity services such as the ones based on OpenID or OAuth 2.0). Federation methodologies will be based, again, on open standard and technologies, to ensure maximum outreach and facilitate business exploitation of the developed methodologies. Objectives: design and implement a cloud-based e-security infrastructure needed to provide end-to-end device e-security and trust. The thesis will start from a study of the state of the art and a subsequent implementation of security AAA (Authentication, Authorization, and Accounting) mechanisms for data and privacy protection from mobile devices up to cloud services. Special attention will be given to well-established techniques oriented to Public Key Infrastructures (PKIs) based on certificates’ exchange. Furthermore, open communication protocols will be preferred, able to natively provide data encryption mechanisms – such as Transport Layer Security (TLS) – and authentication techniques –such as Simple Authentication and Security Layer (SASL)-. Contact: Send a resume with attached the list of exams to giuseppe.rizzo@linksfoundation.com specifying the thesis coda and title. Contact: send CV to marco.gavelli@linksfoundation.com specifying the thesis code and title. Contact: send CV to olivier.terzo@linksfoundation.com specifying the thesis code and title. In the context of intelligent transport systems (ITS), a wide set of standards are being developed with the aim to allow ad-hoc communication between vehicles and allow vehicular applications to access vehicle information in real time. Currently, the standard common aggregation point of vehicle information, is the Local Dynamic Map (LDM). LDM is a database that contains a real time picture of the ITS environment surrounding the vehicle. From the application point of view, a set of applications (designed at ISMB) intended to provide information from vehicle to LDM and exploit information available on the LDM, are under continuous development in order to build a standard compliant prototype of ITS vehicle’s on board unit. Current ongoing developments of such LDM require specific design decisions in order to fulfill performance targets for future vehicles and being also compliant with the ITS standard. Contact: interested candidates send a resume with attached the list of exams/grades taken during the Bachelor of Science to daniele.brevi@linksfoundation.com specifying the thesis title. Contacts: send a resume with attached the list of exams taken during the Bachelor of Science to claudio.pastrone@linksfoundation.com specifying the thesis code and title. Acronyms like H.265, VP9, MMT, DASH, WebRTC, UPNP 2.0 are becoming familiar in these years as new and promising standards for video encoding and multimedia transmission. The objective of the work will be defined more in details when the thesis will be carried out according to the most attractive technologies at the moment and the student’s interests. As an example, tests using the software verification model of the new H.265/HEVC video codec in different scenarios can be performed and also its extensions for future applications can be analyzed. Unmanned Aerial Systems equipped with video cameras usually require a significant bandwidth to transmit in real-time data to the ground for live analysis and mission control. State-of-the-art mobile infrastructures (3G, 4G…) nowadays offer a very time-variant channel to transmit such information so the adaptation of the video stream is a desired feature. The objective of this thesis is to study a framework able to perform an on-board live H.264/AVC video encoding by means of dedicated HW boards. Different configurations and solutions will be analyzed to gather information about performance and complexity of such a scheme. Furthermore, on-demand adaptive streaming will be studied and implemented in order to adapt the data rate to the actual channel state.